OUR PRACTICE IS BUILT ON TRADITION, EXCELLENCE, AND POSITIVE PATIENT OUTCOMES. WE MAKE YOU SMILE. Our practice has over 50 years of combined dental experience. Over 50 years of combined dental experience. Drs. 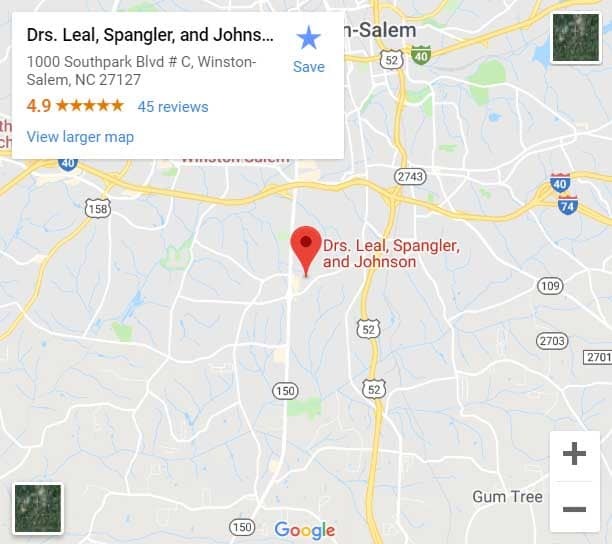 Leal, Spangler, and Johnson in Winston-Salem, NC provide the highest quality dental care with a personal touch, thoughtfully considering each patient and their needs. We offer comprehensive family and esthetic dentistry and love helping people achieve a healthy smile. Preventing bone loss and restoring both the look and feel of your teeth is relatively easy now with dental implants. These permanent, titanium implants can often be installed in only a few visits to our dentists, and last for life. They look and feel natural, and can restore a smile that was damaged due to the loss of a tooth. When you have lost teeth, it can put a damper on your smile and your ability to chew properly. Using dentures, our dentists can craft a custom solution that works as teeth and gums and will help prevent bone loss while letting you smile and chew again. This long-term solution can even be repaired or replaced later if necessary. Mouth guards can help you avoid hurting your teeth during the night, particularly if bruxism is a significant concern for you. You can get a pre-made variety, a custom type that perfectly fits your teeth, or a mid-range version that should still be comfortable. Our dentists can help you find a solution to fit your budget and your life. When cavities or small chips occur, many times dental fillings are the best solution to stop any further damage from happening. Our dentist will remove the area of decay, and then use either an amalgam or composite filling to make your tooth whole again. Your tooth's functionality and appearance can be restored in only one visit. It is easy to think about going to the dentist when you have pain or inflammation. What may not be as obvious is that if your mouth situation is monitored regularly, many problems are stopped before they even become noticeable. Preventative dentistry is the process of regularly seeing your dentist, so there is a baseline, and anything that starts to go wrong can be made right immediately. Tooth replacement can be an option after an extraction, but it is even better to keep your natural teeth. Root canals may not sound pleasant, but they are now a comfortable way to stop an infection within your tooth before it gets any worse. Our dentists will help you through the process of getting saving your natural tooth. In some cases, a tooth simply cannot be saved or your entire mouth can be badly offset because there is no room for a particular tooth. In these cases, tooth extractions are the best method of sacrificing one tooth for the sake of the rest or getting rid of a severely damaged tooth. Children can develop teeth very early, and learning to take care of their teeth is important. Pediatric dentistry is when children up to the age of 11 get regular checkups, x-rays, and learn how to care for their teeth, so serious problems do not happen. Developing great oral care habits can also head off serious problems later in life. When a tooth is chipped, cracked or simply needs protecting, dental bonding can help a lot. Unlike with crowns, bridges, and veneers, reshaping of the tooth is almost never necessary. The resins or high strength plastics that our dentists use can be applied quickly and easily, preventing any further damage and helping teeth stay strong. If you are missing teeth, dental bridges are a great way to replace them and keep your mouth working as it should. The dentist creates custom new teeth that can then be put into place permanently, to keep your smile and your bite as they should be. This also prevents you from suffering bone loss down the road. Dental crowns are used when a tooth is severely damaged, but not infected to restore it to its best condition. A dental crown can be made of resin, alloy or even gold, and helps you to chew, speak and smile as you are supposed to. Our dentists can walk you through the entire dental crown process. If your bite is not aligned in the best way or your teeth are simply crooked, braces are not your only option. Invisalign is a process where a specially made series of bite guards are custom made for you. You can take out Invisalign to brush, floss and eat, and you never look like you have braces. But the effect of gradually shifting your teeth can make a world of difference. Porcelain veneers are great for when your teeth are damaged but are still structurally sound. Your veneers are custom made for your teeth and can be bonded within only a couple of visits. In addition to helping keep your bite great, veneers also help your smile because they can be colored to brighten your teeth. Teeth whitening is a set of cosmetic procedures when your teeth are healthy but do not look their best. Using simple method, this utterly pain-free process lets you look more youthful and restores your smile to its best aesthetic appearance. Our dentists can usually do this in only one session. Cosmetic dentistry refers to helping you have a better-looking smile when your teeth are already in good shape, but simply do not look their best. Discoloration, chips, and cracks may happen, and cosmetic dentistry can restore your teeth to a state where you will be confident in showing them off again. Drs. Leal, Spangler, and Johnson provide the highest quality dental care with a personal touch, thoughtfully considering each patient and their needs. Our dentists are focused on exceptional outcomes through individualized care. Be it for you or your family, our dentistry is comprehensive, attentive, and compassionate. Consider visiting our Winston Salem location to see for yourself why so many families choose Drs. Leal, Spangler and Johnson. We offer comprehensive family and aesthetic dentistry and love helping people achieve a healthy smile. Drs. Leal, Spangler, and Johnson are Winston Salem's most complete dental office. We offer Preventative Dental Services such as Deep Teeth Cleaning, Restorative Dental Services such as Dental Implants, and Cosmetic Dentistry such as Porcelain Veneers. Schedule an appointment with one of our dentists today. What Expectation Should I Have For A Trip To The Dentist? What Is A Dentist Exactly? What Do They Do? How Often Should I Schedule To Visit The Dentist? What Are Some Tips For Finding The Best Dentist Near Me? Drs. Leal, Spangler, and Johnson proudly served Winston-Salem, NC and neighboring communities.